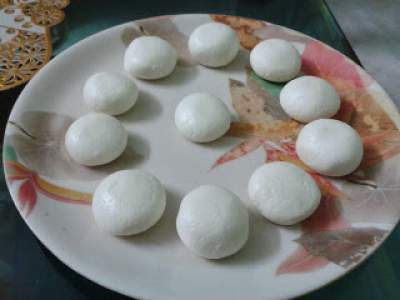 Sandesh/sondesh is a bengali sweet which is famous all over.Kachha gola/kacha golla is one kind of sandesh in which the chena/paneer is not cooked.Hence the name kacha meaning uncooked.These balls of chena mixed with sugar taste delicious.. When it comes to boil add lemon juice mixed with some water. Now you would see the milk solids separating out from the water.Do this on a low flame. Drain out the water and wash the chena/paneer with water to remove the lemon smell. Collect the paneer in a muslin/soft cloth and keep some weight over it so that the excess water goes out.Keep it for an hour. Now knead the paneer with the palm of your hand for about 5min. Mix in the sugar and knead again for 5min till the sugar and chena are mixed well. You can add elaichi powder or rose water/gulab jal for flavour. Make round balls out of the chena. Refrigerate them for 2-3 hours.